Each Hi-Lo Trailer cover from Calmark Cover Company is made to order – cut to fit the exact length, width and height of your trailer. It comes with a custom zipper door for easy access and our FSR construction and friction reducer tie straps – AND our exclusive new feature, the “Quick and Easy Tie Down System”. Made to order with Sunbrella® with a FULL 6-YEAR WARRANTY! PLEASE DO NOT USE MANUFACTURERS SPECS. ​If we have not already provided you with a dimension sheet during our Fast Quote process, or you have additional custom needs, please email or call us at (800) 838-7236. ​Always feel free to call or email questions on how to measure. 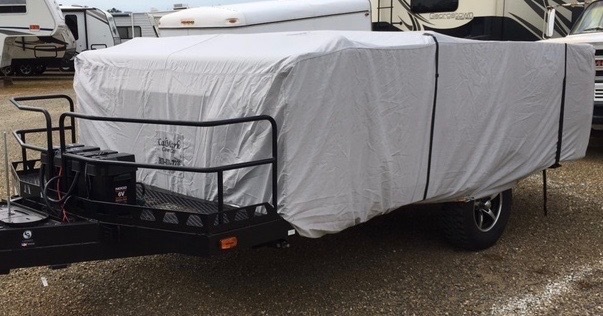 All CalMark RV covers are breathable, water resistant, non-abrasive and mildew and dry rot resistant. *Any pictures or photos represented on this site do not necessarily indicate actual color of cover material.